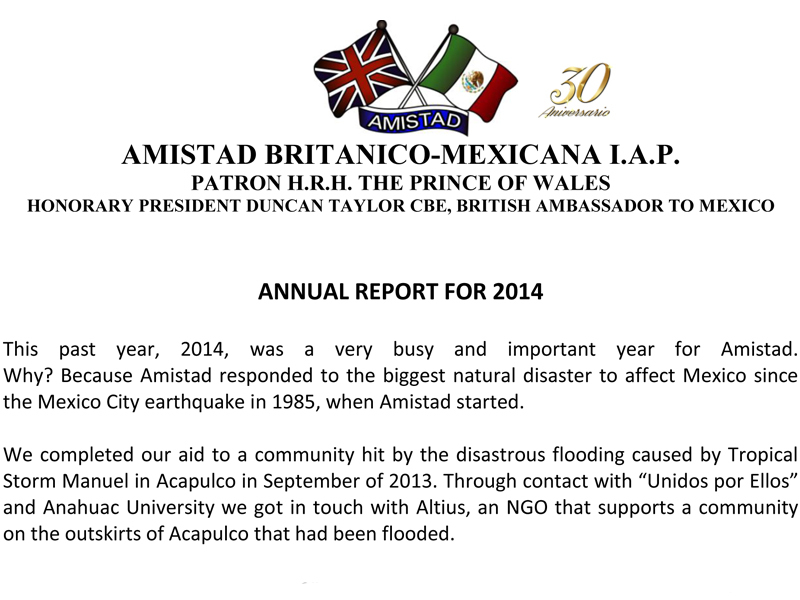 Annual Report For 2014 - Fundación Amistad Británico-Mexicana I.A.P.Fundación Amistad Británico Mexicana I.A.P. We spent just over half of the one million peso campaign funds to pay for repair of medical equipment at the community clinic damaged in the flood. Staff at ABC generously helped to QC this. Of course the electrical system needed overhauling and some minor maintenance done on the doors and walls. The result is that the clinic can now go back to offering not just simple check-ups, but also important healthcare services such as mastography, bone density and ultrasonic screening. Patients are starting to take advantage of these services and we expect numbers to grow as word spreads around the community. 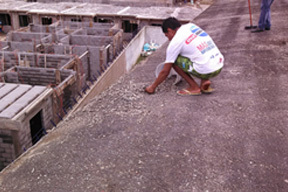 With the other half of the funds we completed waterproofing the existing roof of the community school. We also repainted five classrooms and refurbish them with new desks to make more space available for the expected influx of pupils from the new families moving in. Classes are slowly growing. We will not know the full measure of the benefit of our project until community dynamics have had time to evolve. 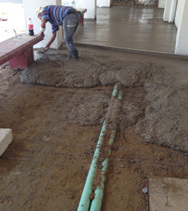 Another project we started at the end of last year, completing it only last month, was the third and final stage of repairing a school in Coatzacoalcos that had been damaged by excessive rains during Hurricane Alex, four years ago. 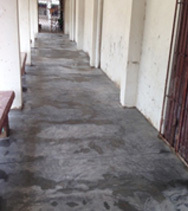 This we were finally able to do with funds from Heineken and opens up this part of the school for the pupils and staff to use again. 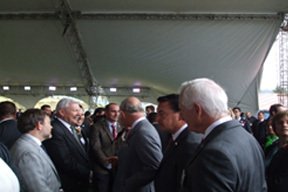 An event that marked the uniqueness of Amistad in Mexico was the visit of our Patron, His Royal Highness, The Prince of Wales and his wife, the Duchess of Cornwall to the school we support in Real del Monte, Hidalgo. 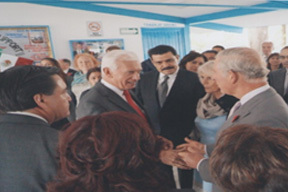 His Royal Highness showed keen interest in Amistad´s involvement with the school and seemed to enjoy meeting our board members. The visit inspired us all to do more for this and similar schools around the country. I want to express my most sincere appreciation for the support from our benefactors last year, especially Moncar, Provident and Heineken, as well as in-kind support from Zimat, AyZ and Lebrija, which together with donations from individual members, enabled us to engage in the important disaster relief programmes that Amistad was founded to undertake. Such projects demonstrate the continued concern British citizens have towards their fellows in less fortunate circumstances. This is especially relevant as this Dual Year highlights Mexican-British relationships. 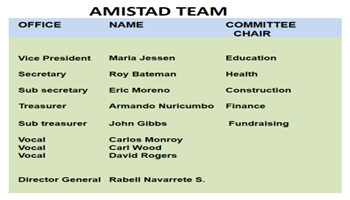 Finally, I wish to thank the board members for their support during the past year and especially to the executive committee members and our general manager without whose hard work and dedicated time we would not have been able to help the communities we serve. 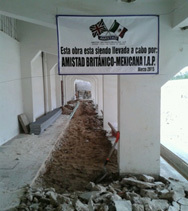 Esta entrada fue publicada en Fundación Amistad Británico-Mexicana I.A.P. y etiquetada Amistad Británico-Mexicana I.A.P., Colin Stabler, Fundación, Reporte Anual por Fundación Amistad Británico-Mexicana I.A.P.. Guarda enlace permanente.